A short history of the Principles and Purposes followed by essays from present-day UU leaders including John Buehrens, Marilyn Sewell, Earl Holt and Barbara Merritt. Excellent for use in new-member classes, as well as for those seeking insight into this essential piece of our living tradition. Individual freedom of belief; discipleship to advancing truth; the democratic process in human relations; universal brotherhood, undivided by nation, race, or creed; and allegiance to the cause of a united world community. The principles were widely accepted, quoted in denominational literature, and included in the statements of purpose, covenants, and bonds of union of many congregations. 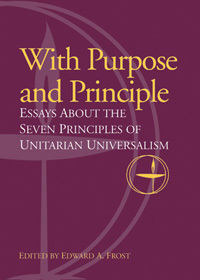 When, in 1961, the American Unitarian Association merged with the Universalist Church, the five principles were incorporated into the new association’s Statement of Purpose. Echoes of those principles can still be heard in the current Principles and Purposes of the Unitarian Universalist Association.